HRM now owns 19 houses between Highway 102 and Connaught Avenue. The city owns the properties shaded yellow on this map. The intersection with Highway 102 is on the left (western) edge of the map, and Connaught Avenue is on the right (eastern) edge. Halifax council continues to purchase property along Bayers Road, part of a long-term but controversial objective to widen the road. Last week, council agreed to buy 6830 Bayers Road, a two-storey house on the south side of the street, from Michael Dudka. Dudka is president of the Delta Group, a financial planning firm with offices in the house, and made an unsolicited offer to the city to buy the house. The property is assessed at $254,900, but the sale price is not yet public. Last week, Halifax council voted to buy this house at 6830 Bayers Road, for an as-yet to be disclosed price. When the sale of 6830 is finalized, the city will own 19 of the 31 houses between the intersection with Highway 102 on the west and Connaught Avenue on the east. In 2009, the city bought two other houses on the south side of the street. The house at 6838 is assessed at $209,600; the city bought it for $239,000. Two doors down, 6850 is assessed at $210,400, but the city only paid $169,900 for it. 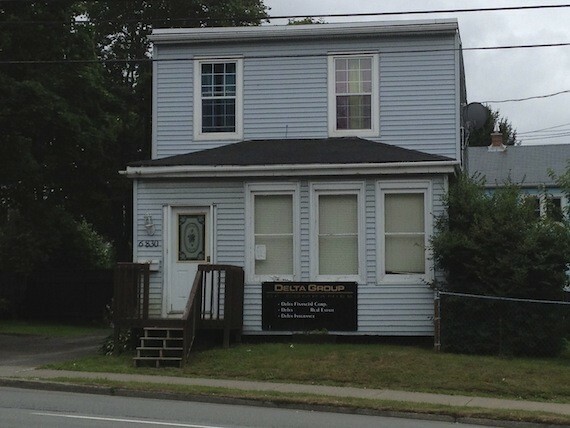 Rental of the houses is managed by City Group, a Dartmouth property management firm. The city declines to make public its exact rental income from the houses, but gives a range of $900 to $1,100 per month per house, dependent upon condition, amenities and size. The remaining 16 city-owned houses are on the north side of the street, part of the sprawling Westwood Park, former military housing that is now a public housing project known colloquially as The Pubs. While the city owns the property, Metro Housing is entirely responsible for rental and maintenance of the houses. The Bayers widening is part of a larger project to widen Highway 102 to six lanes all the way to its intersection with Highway 118. The entire project will cost in the ballpark of a billion dollars, although no estimates have been put to the city portion of the project, which is Bayers Road. The stretch of Bayers between 102 and Connaught is slated to be widened from four to six lanes. Previously sealed staff reports from 2009 acquired by The Coast say that houses on the north side of the road, The Pubs side, are not required for the widening. But the staff reports say the seven houses on the south side will have to be torn down to accommodate the widening. Further east, from Connaught to Windsor, the plan is for Bayers to be widened from two to four lanes. There are several dozen houses along this stretch, most very close to the roadway. The city owns only a vacant lot at the corner of Windsor.